This appears to be the verandah of a summer house, waiting quietly for its inhabitants to saunter through it for lunch in one of the more shaded areas. Not for it the hustle and bustle of people running around in search of - well, whatever it is that they would run in search of. It invites you to sit down, relax and exchange stories about what is going on around the world, and your opinion on those goings-on. That is what actually goes on behind those heavy wooden doors. There are a few clues out there for you to guess where this is. The picture above the doors: on the left, the original holy cow, Kamadhenu, representing auspiciousness. On the right, the elephant, indicating strength and power. In between the two, grass (for new growth), the lotus (purity and independence), the Indian subcontinent (harking back to the pre-Independence days) and the sun, a source of vital energy. In the centre, the conch reminding everyone that this organisation carries the voice of the people, and is the announcer of vital news. Yes, this is one of the lobbies in Kasturi Buildings, the home of "The Hindu". In case all those clues were not enough for you to have guessed it, there are portraits of two of the former Managing Directors of Kasturi & Sons: Narasimhan and Kasturi. Maybe it is difficult to be footloose and fancy-free under their stern gaze. In any case, "The Hindu" is not known for its frivolity or frothy reporting - and we are so much the better for it! Just because this seemed too good to pass up, on the sidewalk of the Marina. They should have given the photographer a pair of shades, as well! Early morning on the Marina. Kannagi seems to be directing the sun on where to shine. According to legend, she set the whole city of Madurai on fire when her husband was falsely accused, and punished, in a case of having cheated the queen of her anklet. That was eons ago. This statue of Kannagi is much more recent, and Chennai is not Madurai, anyway. But is Kannagi the reason why December continues to be so warm? When I was taking this photograph, I did not realize that these gates hid a long driveway into Bedford House. Most of that driveway is hidden by the trees that grow on the grounds, but I can tell you that on your way out, you will find half the route different from what you saw on the way in. Considering that it is owned by a branch of an illustrious family of industrialists and bankers, it should not be surprising that this house is set in a large patch of land, or that there is no way we can see any part of the house from these gates. The Bedford House has been with the M.Ct. family for just over a century, now. It was in 1915 that M Ct Muthiah Chettiar, who had moved to Madras from the family seat at Kanadukathan, bought this place. There seems to be no indication why the sellers, Mercantile Bank of India, wanted this property off their hands. They may have to wait a long while for that to happen! The shrine of Lord Ayyappa at Sabarimala, in Kerala's Pathanamthitta district, has had its share of misfortunes. One such was a deliberate act of desecration and arson in 1950, that left the stone idol severely damaged. A new panchaloha idol was wrought, and before its consecration, it was taken to several parts of the country. During its perambulations, the idol was brought to this temple on Armenian Street - from where, for one reason or another, it could not be taken out for three days. To recall this incident, a shrine to Ayyappa was added within this temple complex, which has Lord Siva as the main deity. The temple - the Kachhaleeswarar temple - was constructed in the 1720s, funded by the dubash Kalavai Chetty, who was a devotee of Siva in the form of Kachhabeswarar, the one worshipped by a tortoise. According to mythology, the tortoise was Lord Vishnu, who had assumed that form during the churning of the ocean of milk. 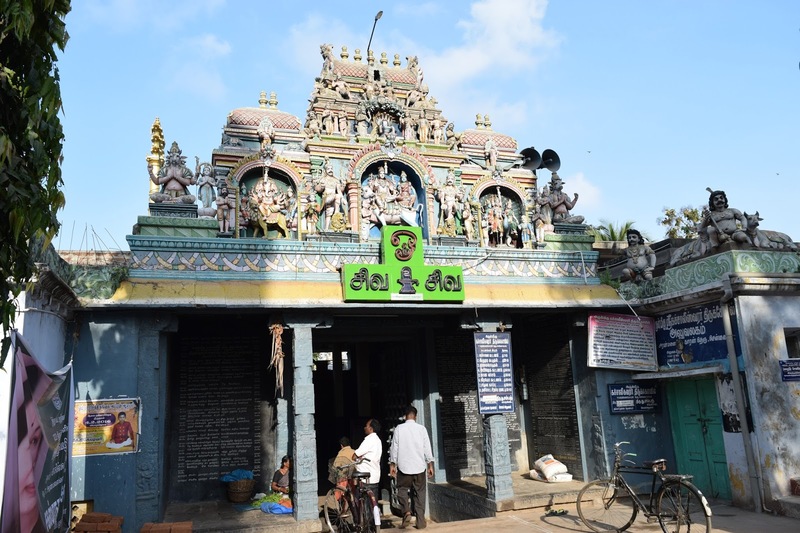 The tortoise also forms one of Siva's five seats in this temple; on account of having these five seats, the deity is also referred to as Pancha Vaahana Sivan. In ancient times, there was a federation of castes based on their 'handedness'; those engaged in agriculture and related fields were referred to as the 'right-hand castes', while the metal workers and weavers formed the numerically lesser 'left-hand castes'. These divisions continued into the early 20th century; but in Kalavai Chetty's time, it was common for Madras to be wracked by clashes between these castes. And Kalavai Chetty was himself accused of engineering these clashes; but he is today remembered for this temple, rather than for the divisions he attempted! The Wesley Church on Whites Road survived Cyclone Vardah with little damage to the main building. But outside, almost all the trees along its walls have been uprooted; the wall along Westcott Road has given away completely. The walls will be built again. The trees will be re-planted, and will grow big and strong again. But right now, these are minor inconveniences that worshippers will have had to suffer today. And there will be many of them coming here today. Faith will not be buffeted by a cyclone or two, not when it has survived for 2016 years - merry Christmas, everybody! Stepped out of the house at 5:00am today; it is the 89th anniversary of the Music Academy and a few of us were going on a tour of the Academy's many locations before it acquired its own premises - that's the iconic TT Krishnamachari Auditorium on Cathedral Road. That tour had to start from the TTK auditorium and when we got there, we found there was a crowd of about a hundred people waiting. Many of them had formed some kind of a line, the chairs lined up from the ticket windows to the entrance doors, and beyond. The rest, about 20, were standing in a group a little apart. We quickly figured out where to go, we were to stand with the group. The rest of the crowd, sitting in line, were waiting for the ticket windows to open so they could try and get tickets for the kacheri of the day. And that was going to be Sanjay Subrahmanyan (we have spoken about him before here and here), the Academy's Sangeeta Kalanidhi of 2015-16. Of course the line would have gotten longer. Not for the music-loving Chennaiite the long queues formed because of demonetisation. We would rather wait in line for a kacheri ticket, and not be perturbed in the least because we were way behind in the line, and tickets were sold out before we were even close to having our chance. Anyway, the good thing was that there was some 'Academy' coffee being handed out to those waiting for tickets - and I managed to snuck some of that! Have you ever wondered how many different kinds of fauna share the city with you? No, I don't mean those "animal types" on the road - there is only one animal that can display road-rage, anyway. I am talking about other life-forms, and if you are a Chennaiite pondering that question, try this book by Preston Ahimaz - you fill find many more than you thought likely. And if you are more specific about the kind of life-forms, you will surely be able to find specific books about them. R. Bhanumathi, has written a series of handbooks - on butterflies, dragonflies, birds, etc., It is in Tamizh and I am sure it would have opened up a world of wonder for a few of the thousands of Chennai's children who do not read English. But somehow, I felt confident enough about this lovely butterfly that I did not have to refer to either book to figure out this is a lemon pansy (precis lemonias)! Let us pretend that you were walking along the northern pavement of Sir Thyagaraya Road, Pondy Bazaar, on a busy afternoon. Naturally, you can't see the signs of the shops because they are right overhead. You look at the displays. And then you suddenly find this little shop door with a couple of stools put out in the front. No glass frontage, no mannequins on display. An old timer sits on one of the stools, contentedly looking on at life passing by. The wooden doorframe, set back from the street, has the word "Kerala" written above it. Peeking inside, you are greeted with a row of empty chairs, display racks and shelves, for all the world looking like a reading room of sorts. Welcome to the oldest salon in Chennai. It has been 76 years since Sankunni Nair hung up his shingle in Madras. Kerala Hairdressers is now managed by Sankunni's grandson Sandeep. It does not have the slick design or the chirpy conversation of a newgen coiffeur. You are considered a regular only if your first visit to this establishment was as a kid hanging on to his dad's hand - or if you bring your son over for his haircut. 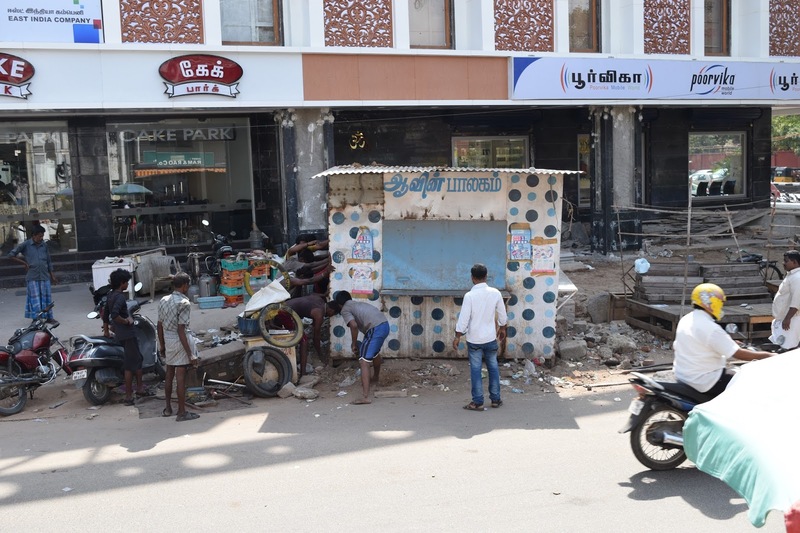 It is that kind of a place, where time stops to swap stories of the city, where the English and Tamizh newspapers provide the stage for the clientele to dissect the news for its relevance - and irrelevance - to the patrons. Don't get fooled into thinking you can just walk in here anytime you feel the need to have your tresses trimmed. It just so happened to be a lazy weekday afternoon. If you have to come in on a weekend, or after office hours, you had better be prepared to wait and enrich the buzz of conversation with your observations. Else, it will be a long, lonely wait for you! This building, on a street off TTK Road, is quite unremarkable but for the contrast it provides to its more modern neighbours. But it is also unique in being probably the only house in the neighbourhood that has a flagpole in the front yard. And under that thulasi plant near the flagpole is something that makes this building one of the very few, not just in Chennai but across India, hallowed grounds of independent India. The building houses the "Srinivasa Gandhi Nilayam", that name paying homage to the "two fathers" of Ambujammal, the lady after whom the street is named. Her biological father was S. Srinivasa Iyengar, a highly respected lawyer who in 1920 returned his CIE and resigned his position as Law Member on the Governor's Executive Council in the wake of the Jallianwala Bagh massacre. Though Srinivasa Iyengar left the Congress owing to his differences with Mohandas Gandhi, he did not in any way thwart his daughter, fired by the vision of the Mahatma, following him ardently, or oppose her claim that Gandhiji was her foster father. Ambujammal established the Srinivasa Gandhi Nilayam in homage to both her fathers. That was the platform for her to throw herself into social work, continuing her contributions from the mid 1920s right into the 1960s, as the Chairperson of the State Social Welfare Board from 1961 to 1964. The Nilayam was the place where Gandhiji's followers in Madras would meet and decide ways to further his programmes in the city and the state. Whenever Gandhiji would go on a fast, there would be prayer sessions conducted at the Nilayam. Such a profound connection with the man ended with his assassination in 1948. But wait, the connection continues. You see, a portion of the Mahatma's ashes was brought here and interred under the thulasi plant you see. No wonder then, this is a place of pilgrimage even today for anyone claiming to be a Gandhian! It is highly unlikely that anyone reading this would get to travel in a train on this line. No, that's not meant as a challenge, for this is not a line meant to carry passenger traffic. It runs inside the Port of Chennai and is meant to carry freight. And that's rather unique, because there are very few railway lines that are operated outside the control of the Indian Railways, and this is one of them. Besides railway lines, but the Port of Chennai also has a Terminal Shunting Yard within it. The lines run for 41km within the harbour; there are designated sidings for specific kinds of cargo - apart from those for general dry bulk cargo and a dedicated sidings for container traffic. The tracks run for a few kilometres outside the harbour area as well - without that connect, how could goods ever get out of the port! You have to be a dubashi to figure out what's awkward with this street's name. Leading off from NSC Bose Road, across the road from the High Court complex, it is quite possible that it could lead to some kind of barracks. No awkwardness, for sure, if you know only English. If you know only Tamizh, you wouldn't be too worried about sign saying "Baker Theru". After all, there are quite a few streets in the city whose Tamizh names sound quite different from their English versions. The big question in this case, however, is about which version is correct. Is it Baker, or Barracks? Or was there a Baker in the Barracks? Chennai's early history has a few candidates for the 'Baker' in this street; Henry Davidson Love's "Vestiges of Old Madras 1640-1800" lists eleven Bakers in its index. Of those, six are merely name entries, and two are related to one of the more storied Bakers. The first of the remaining three was also the first on another list - in 1652, Aaron Baker took over as the first President of Fort St George - an early attempt at creating a Madras Presidency. The second, Charles Baker, is listed as a 'Civil Servant', with some mention of "his pursuits". But it is the third one who is the likeliest candidate to be the eponym for this street. That man was Captain George Baker, whose first visit to Madras seems to have been as the captain of the sloop Cuddalore, arriving in the city in 1756. For some reason, this Baker seems to have had a run of stop-gap appointments: his captaincy of the sloop seems to have been because of a heavy death toll at Negrais, Burma and the sloop sailed out of Madras with a new captain (John Howes). Baker seems to have been within a whisker's breadth of being appointed as the Ambassador to the King of Burma before his return from Negrais. The listing of Chennai's mayors lists a Captain George Baker for less than a year (1765-1765) and then again as an interim bearer of the office in 1773. But the reason for his being memorialized in the city is better explained by Sriram here! Wikipedia tells us that games played on a cloth covered table, using a cue stick to strike smooth balls, have been around since the 15th century CE, under the generic term 'billiards'. They evolved from outdoor games like croquet and bowls, and have diversified into a wide range that includes billiards, snooker, pool and several variations of each of these. Given that timeline, cue sports gained popularity in Madras fairly late. The following it his is neither very vocal nor very visible - but with my limited experience, that could be true of cue sports in most places in India. Considering that Madras was the host to the first ever All India Amateur Billiards Tournament (in 1904), it is reasonable to expect the game to be a little more popular here than elsewhere in the country. However, for some reason, it is not so. I cannot recall any international - or national - billiards champion from Chennai. The same holds true for snooker; and that is even more galling, because that game is supposed to have originated in India. According to the Billiards and Snooker Federation of India, it was created in Ooty - and therefore in the Madras Presidency - in the year 1881. While that claim is contested, with the rival version having Jabalpur as the town and 1875 as the date, we shall in this case accept the version put out by BSFI. The Tamil Nadu Billiards & Snooker Association, makes no such claim, however. Having been formed in 1981, a century after the birth of snooker, the TNBSA is more concerned with "controlling and guiding the game in the state", than with weighing in on historical claims. I am not sure what level of control they exercised during the early 1990s: there was a mini-boom in the game in the city, with snooker parlours being set up across the city and, for a brief while, being the to-be-seen-in places. Whatever they did, or did not, one wishes they would soon find themselves a better office space than in this nondescript building on Avvai Shanmugham Salai! Moving from the white-on-blue lettering that seems to have been the favourite of signboard makers over a couple of centuries into this rather jazzy red-on-yellow scheme must have been the decision of a very brave man. Or someone so secure in the permanency of the business to not bother with such trivialities as signboard colours. Such a signboard, made around 50 years ago - that's a guess, and yours might be better than mine - still advertises the supplies provided by the Office Equipment Company, of Armenian Street, Madras. Although I have not myself seen the offices of this company, I am fairly sure it continues to exist. It must be somewhere upstairs in one of those buildings on Armenian Street, trying to stay relevant for the office supplies and 'requisites' of the day. Considering that no one below the age of 40 has conceivably never seen a cyclostyle machine, it would be fair to say that as a business, nothing on the right of this sign is left, these days! The whole concept of Madras, as you may know, came into being due to the supposed availability of fabrics in the hinterland, which a 'factory' in Madras could exploit. Having started off on this flawed premise, it was necessary to ensure that the city did supply cloth of various kinds. Therefore, it does not seem surprising at all that a Gujarati comes to Madras to set up a business styled as "Benares, Kollegal, Madura Cloth & Musk Merchants". Mani Sunker Davay set up this business in 18... and brought his son into it later. Today, it is run by his descendants, possibly in the same location that the founder conducted his business. For that reason alone, it deserves to be famous. The kind of cloth that they trade in includes garments designed for ceremonial occasions - veshtis, angavastrams and the like. Benares is of course famous for its silks; Kollegal is well known for its gold-laced cloth, besides its silk weaving. The Gazetteer of South India, sometime in the 1880s, notes that "...some of the silk cloths made here cost as much as Rs.300 each, or even more, according to the gold and silver embroidery...". Madura - with its famous art of making lacework in gold and silver, for the borders of turbans and other cloths. That Mani Sunker traded in such cloth shows off the nature of his clientele. Even today, he is the preferred supplier to famous singers - Sanjay Subrahmanyan being one who swears by Mani Sunker Davay for all his concert wardrobes. But the most intriguing feature of this board, for me, is its break with 'tradition'. There are many who still refer to this city as 'Madras', refusing to acknowledge its 1996 renaming to Chennai. 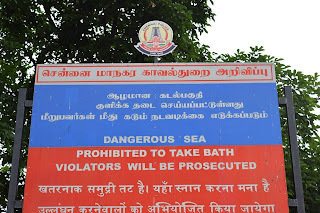 They all forget the fact that even before 1996, it was very common, if not the standard practice, to use 'Madras' in English versions and 'Chennai' in Tamizh. 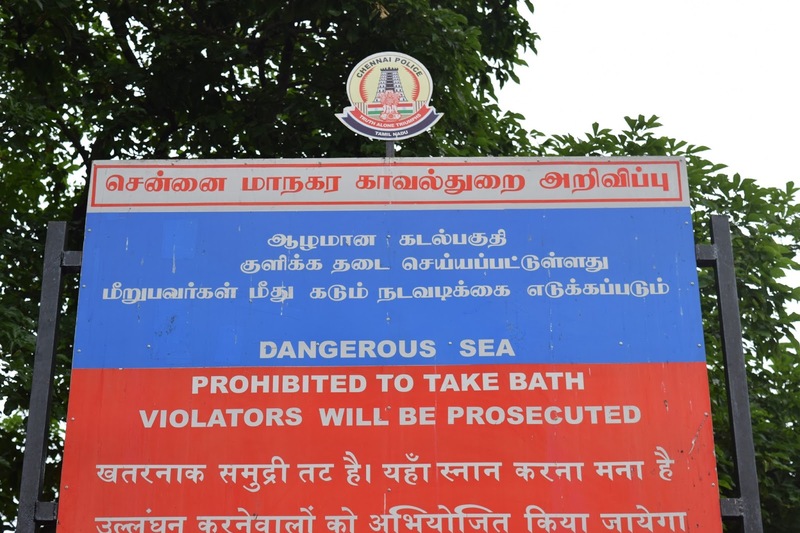 However, this signboard not only shows the word "Madras" in Tamizh, but has spelt it using a script that was replaced sometime in the 1970s! If you happened to drive across Chennai yesterday, you would have been surprised at the density of greenery lining the roads. No matter what part of the city you were in, the green roadsides would have been the default sight. It is not as if the city grew green thumbs overnight; all of the green would have been the effect of Cyclone Vardah, the most severe storm to hit Chennai in a generation. That's what they say, but I will go further to say that C. Vardah is the most severe of the past 50 years at least. The official statistics of the numbers of fallen trees is in 3 digits, but most certainly many more than that have fallen. One estimate says 12,000 trees. There are all kinds of debates about which trees were able to weather the storm better than the others. In general, it seems that the "local" species stood up to the winds, shedding a lot of their leaves, and some branches, while the "exotic" species were more easily brought down in their entirety. The jury is still out on that; but being a domestic species was obviously no guarantee that Vardah would be gentle on you. This peepul (Ficus religiosa) tree - I'm told it was over 70 years old - just toppled over, bringing down with it an industrial shed, an electricity post and the power cables running along it. The whole locality has been without power for the past two days. Maybe one of the other trees in the background - the neem (Azadirachta indica) or the coconut palm (Cocos nucifera) - would not have caused this extent of damages! 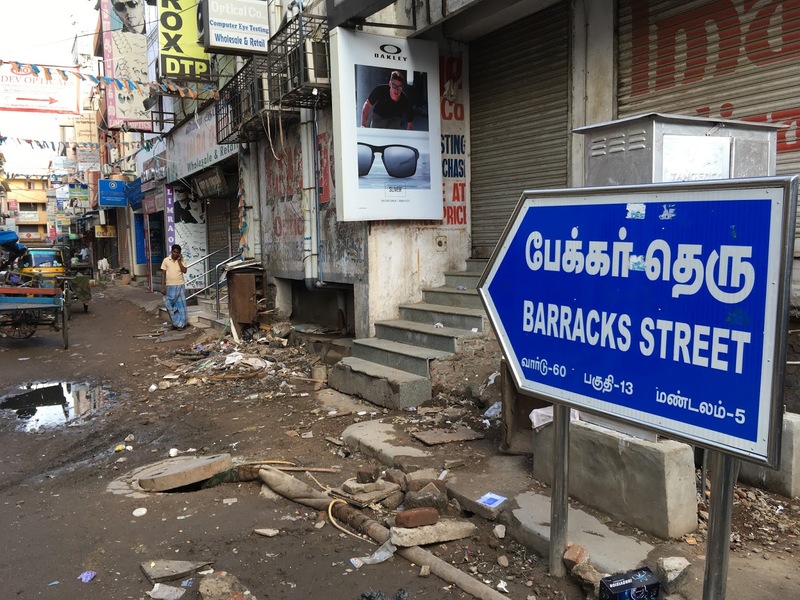 With Madras becoming the favoured spot of the British in the mid-17th century, towns that were important in an earlier era faded away to being footnotes. 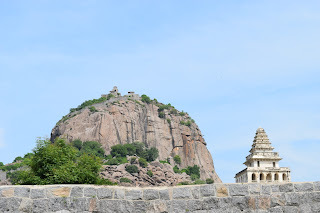 One such is Senjee (செஞ்சி, also as Gingee), about 150km from Chennai. Actually, it wasn't much of a town at any time, but a complex fortification built on three hillocks. It is situated close to the intersection of today's NH4 and SH77; that leads me to assume it would have been in a similar position vis-a-vis yesteryears' trade routes. And anyone occupying this would have strategic control of those routes, for sure. The hillock in the picture is Rajagiri, atop which sits the largest of the Senjee fortifications. There is also a fort at the base of this hillock; one needs to get past that to be able to go up the Rajagiri. Inside the lower fortification are several buildings - a couple of temples, a mosque, a large granary, living quarters for the soldiers and the king (and a huge tank for the elephants to bathe in), a magazine and the "Kalyana Mahal" - no, not necessarily a wedding hall, but that's what you see in the foreground, just inside the fort wall. Kalyana Mahal is a "pleasure pavilion", with a central tank, fountains at all the seven levels, with the open verandahs allowing the breeze to blow in from any side, to be cooled by the fountains. Though the British apparently called it "Troy of the East", Senjee is still not a significant tourist magnet. That is a shame, really. Maybe the steep trek up the Rajagiri dissuades many from experiencing the fortifications fully. The ASI tries to do its little bits and pieces. But woefully short on budgets, there is only so much they can help with. It is time the citizens contribute - at the very least, by visiting and buying the entrance tickets! The grounds of the Theosophical Society - Adyar, spread over 250 acres, have very few named roads. 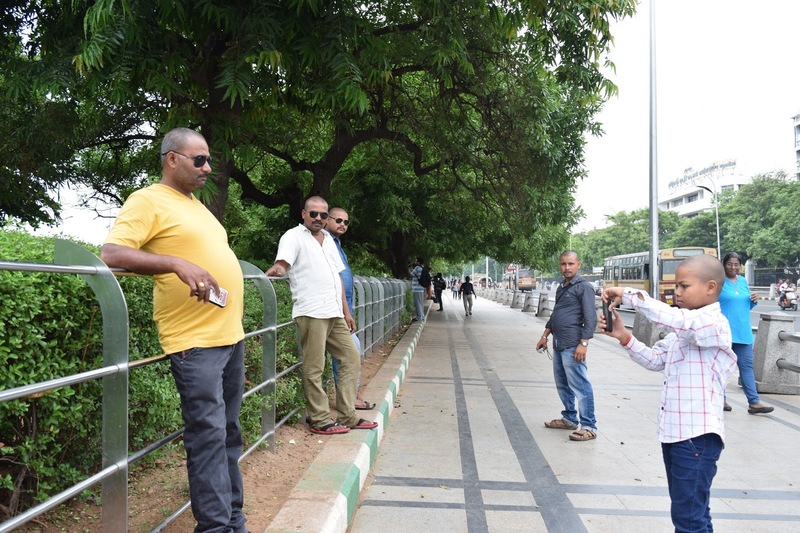 Actually there are very few proper roads inside the grounds, for that matter; they are named after the founders or early presidents of the TS-A. So that takes care of the nomenclature for six of the paths, the ones that show up on Google Maps. Getting around the TS-A involves many other paths, the ones that are not paved, the ones that do not show up on the maps. Here is one such path, running west-east, parallel to the Adyar river, along its southern bank. I am guessing it was called the "River Path" much earlier, and that the addition of "Radha Burnier" was as a tribute to her memory, after she passed away in 2013. She was the seventh President of the Theosophical Society, holding that office for 33 years. Doing so, she edged out the Society's first president, Henry Steel Olcott, who was in office for 32 years between 1875 and 1907. In the 141 years it has been around, the TS has had only 8 presidents - the current one, Tim Boyd, began his term in 2014. He is just 53 now, and has a good chance of beating Radha Burnier's record. At this rate, it will be few centuries before all the paths and byways of the TS get their names! Cyclone Vardah is expected to make landfall this evening. It has been looming as a menacing presence in the Bay of Bengal since Thursday last, building up its fury and even practicing its menace over Thailand and the Andaman and Nicobar Islands. It is expected to be the most severe storm in over a generation to hit northern Tamil Nadu and Andhra Pradesh, the region where it is expected to move over from sea to land. There have been so many instances in the past where such cyclones have veered northwards, sometimes over 90º, to threaten Odisha or even Bangladesh. But Cyclone Vardah seems to be charting a straight path. And it is threatening wind speeds of 95kmph+; Chennai is the biggest city in its way, and we are all bracing for impact this afternoon. Last evening was the proverbial calm before the storm. The sea at the Marina Beach was a little rougher than usual. The mounted police cantered up and down the beach, ensuring that folks were staying up, away from the water. In the midst of it all was this gentleman, probably trying to re-assure members of his family that Cyclone Vardah is not all that fearsome at is being made out - but then, we shall know the truth of that in a few hours from now! Even a rudimentary knowledge of Indian iconography will be enough to know this is representation of Mahavishnu in his form as Padmanabhaswamy - the one with a lotus growing out of his navel - resting on Anantasesha, the divine serpent. Also in the picture are Hanuman, Lakshmi, Siva, Brahma and Narada. This entire tableau is placed above an entrance on Wall Tax Road. With so many deities, you might believe that the entrance is to a place of religious significance. In some senses, that might be true, given our penchant for elevating our heroes to god-like levels; but the reality is that once you go past this, you would be entering the fantasy world of the movies. At least, that is how it was until a few years ago. Last year, the posters announced the advent of a multi-storey residential complex, confirming that the Padmanabha has indeed played out its last show, about 5 years ago. Padmanabha Theatre began life as the Regal; does this tableau go back to those days, when it was placed to bring good luck, or did it come up after (possibly) a change of ownership and name, with the new owner trying to ensure that the re-branding sticks, with this visual representation? If the latter, it couldn't have been too successful - even today, the MTC bus routes indicate this stage as 'Regal'! 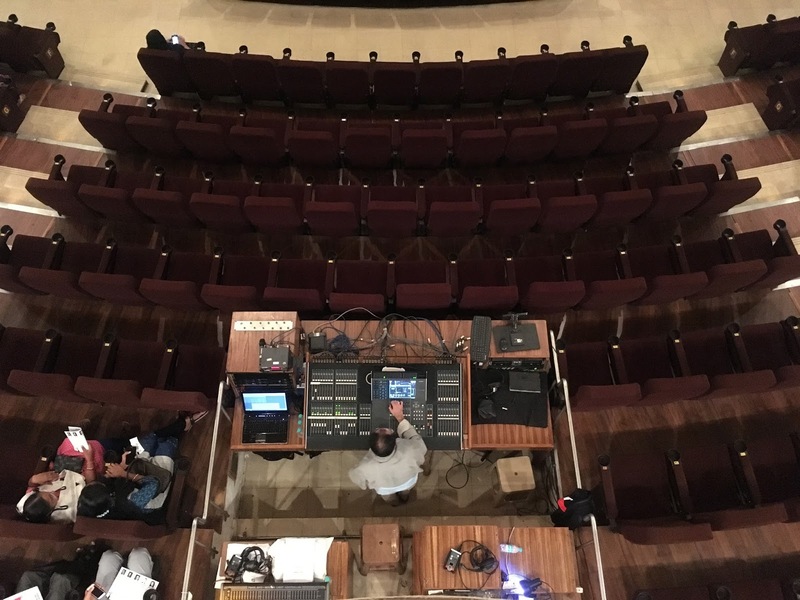 Any theatre would have a designated location for the control booth - the space for technicians controlling the stage lights and sounds to sit and do their work while the performance is in progress. The ideal location for this is, in some ways, the place where the best seats in the house should be; far enough away from the stage to have a full view of what is happening on it, but close enough to not miss out any of the details. Chennai's theatres have different approaches to placing the control booth. 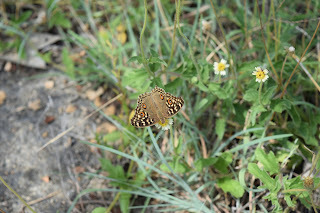 Many of them - at least among the ones I have seen - have them right up front, just at the edge of the stage. The Museum Theatre has it jammed in the centre aisle, crushing into the seats nearby. Obviously, given the age of that building, it is a much later addition and it gives a definite appearance of having been jerry-rigged, as if it has been placed there just for this performance and no more. The control booth at the Mutha Venkata Subba Rao Hall is much better organized. I don't recall seeing this space when I have been on the ground floor - and so I guess it blends well with the seating. 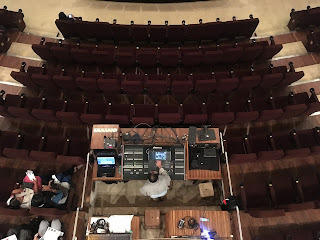 But when looking down on the balcony, it looks like a fairly comfortable area to sit and work - and the best spot to watch the performance from! It has been over 48 hours since the ailing Chief Minister of Tamil Nadu breathed her last at a Chennai hospital, but many parts of the city seem to be in mourning still. Even the airport seemed to be deserted last evening; the usual jockeying of vehicles, to be ahead of the rest in the queue, seemed to be desultory at best. All that was because of J. Jayalalithaa, whose impact on the country's psyche seemed disproportionate to her political presence at the national level. It is difficult for an outsider to comprehend the hold she had on the person-on-the-Tamil Nadu-street; the editorial in yesterday's The Hindu gives you glimpses of why. But it is well nigh impossible to describe an image crafted over 4 decades and more to be encapsulated into a few sheets of newsprint. 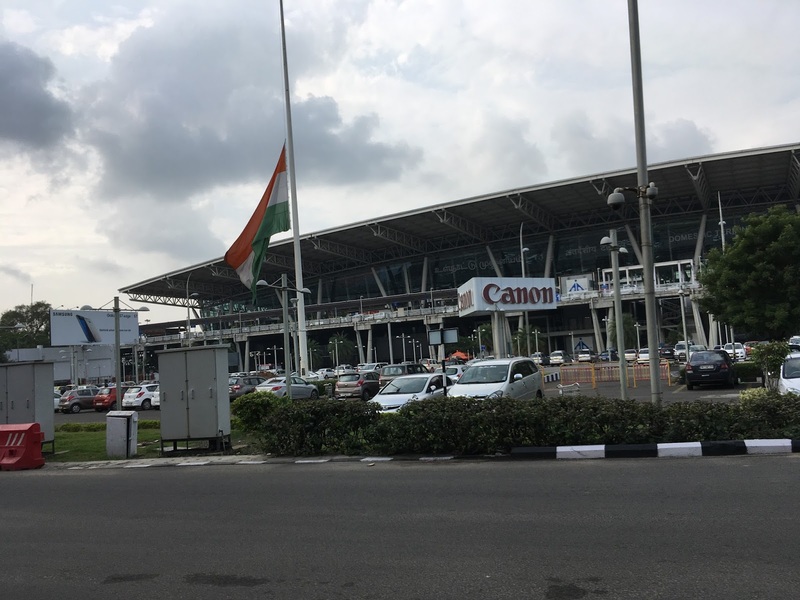 The national flag at Chennai airport is flying at half mast. That is because the state has announced a 7-day official mourning for its former Chief Minister. "Former", only because she is not around any longer. But for millions of Tamil Nadu, she will always be their "Nirandhara Mudalvar" (perennial Chief Minister)! Has this building been around for as long as the year on that small brown board over the door? It is quite likely, given that this was a locality where a lot of publications got their start. What's that? You are not able to make out the board? Well, you can click on the picture to get it to open - you will then still have to enlarge it. For all those pains, you will get to know that the board proclaims "Sastra Sanjeevini Press" and then, in even more faded letters, "ESTD 1900". So what did the Sastra Sanjeevini Press do? As best as I have been able to find out, it published largely in two genres: Religion and Linguistics. It will take much more effort before I can hope to have more information about the history of this institution. But thanks to the Digital Library of India at the IISc, it is possible to access at least a dozen titles published by this House. The oldest of them goes back to 1901 - and that, somehow validates the founding date. The most recent is dated 1934, so that begs the question - did Sastra Sanjeevini Press continue to turn out those tomes? Chances are that it diversified and went into some other genres - maybe ones that the Digital Library project chose to not archive. But the interesting part is that the oldest title in that list - "Bhagavan Siddhantha Saravali", by Subrahmanya Sastri can be printed on demand, and made available in the hard-bound form (US $8.93) or as a paperback (US$6.89). 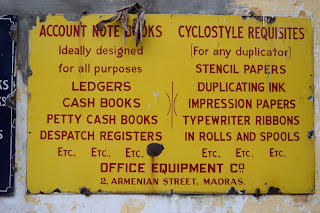 Wonder if any of those greenbacks get back to this building in Chennai! Tucked away off a side street on Radhakrishnan Salai is a rather unique institution. The Sufi Dar is run by a Trust that was founded in 1971 as a dedication to a Sindhi saint, Puj Shahenshah Baba Nebhraj Sahib. Originally, it functioned from Walltax Road, but moved to Radhakrishnan Salai to cater to the growing band of the Puj Baba's devotees. There is no reason to believe that the Puj Baba had ever come to this part of the world. The founder of the Sufi Dar Trust, Ratanchand Sahib, was himself an accidental visitor to Madras. When he was in Madras, he met Dr. Hariram, another visitor to the city, but one who believed that his presence here was pre-destined so that he could initiate Ratanchand. Ratanchand Sahib attained samadhi in 2013. The Sufi Dar Trust continues to carry forward his ideals. They believe that the Puj Baba can be accessed by anyone, not just a follower. But to make any supplicant of the Baba more comfortable, the Sufi Dar accommodates many deities: pictures of Sufi saints, Hindu Gods, the Sikh gurus, Sai Baba, Jesus and Mary, and leaders of various sects, as well as several statues depicting all of these Gods, are all present in the Sufi Dar. Haven't been inside yet. When there is so much divinity around, one must be there in a proper frame of mind, so as to not be overwhelmed by their presence! 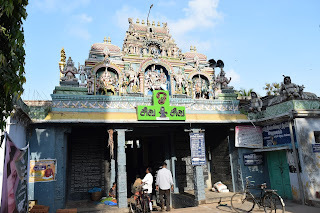 Going along Mint Street, one will come across several temples; it would be very difficult to see any that is grander than the Chennai Arulmigu Ekambareswarar Temple. As with several of the old temples of the city, this one is also claimed to be more than 500 years old; an intermediate period, which is difficult to confirm or deny. What is possible to confirm is that this temple was in existence in the early 18th century, being important enough to feature in the earliest map of the city, dating circa 1710. The more believable version of this temple's origin dates it to the 1680s, when Alangatha Pillai (more about him here), one of the dubashes employed by the East India Company makes a generous contribution to build a temple to his favourite deity, Ekambareswarar. The temple was built close to Fort St George, Alangatha Pillai's workplace. In those days, that part of the world was inhabited by washers and so, it was on Washers Street that Alangatha Pillai's temple came up. In an earlier post about Alangatha Pillai, I had assumed it was his likeness that was sculpted on the pillar just inside the entrance. Turns out that is of a different gentleman, though, like Alangatha Pillai, he too was a benefactor of the temple. And where is it rather difficult to find any reference to Alangatha Pillai in the temple itself, this person's name is written in large letters on the stone canopy in front of the gopuram - Va Mu Appukutty Chettiar! That's a picture of the entrance to the CMBT, taken when passing by on an overhead train track. The "M" in the abbreviation is "Mofussil". A word that I haven't heard used in English very often, but one that gained currency under the British East India Company. A word that I have encountered so often in Madras and Chennai that it could have been Tamizh - and yet, one that unsurprisingly has its origins in Urdu. Mofussil originally stood for those areas beyond the administrative ken of the Company, outside the realms of their headquarters in Madras, Bombay and Calcutta. Somewhere along the way, it gathered connotations of a hayseed provinciality, not compatible with the sophistication of the city. And yet, here is this facility, in the middle of the city, calling itself the "Mofussil" Bus Terminus. No, it is not as if the city expanded to swallow up a bus terminus that was once outside its boundaries. The simpler explanation is that this is the destination for anyone coming into the city by bus from its mofussil areas. It doesn't mater that the origin of bus could be another metro city - Benagaluru, for example - but that doesn't matter; anything outside the city is mofussil. And so here we are, looking down to the transport to the wide world outside, from a very in-city mode of transport - the metro! In a couple of weeks from today, the gates of the MA Chidambaram Stadium will open for the fifth test of the India-England series. In that time, India could have either won the series already, or it could be that England is looking to square the series, having won the fourth test at Mumbai. Either way, there will be a lot of excitement around the test. Chennai has not hosted an international test match in a long time. The last one such played here was almost four years ago, when India played Australia in February 2013; it is about time the next one takes place. So, are you going to be watching this match live? In 1958, the Tamil Nadu government got into the business of supplying milk to the citizens of the state, and in 1965 it took control of all the milk producers' co-operatives across the state. It was much later that it took on a more 'corporate' form, with the Tamil Nadu Co-operative Milk Producers' Federation Limited being formally registered in August 1981. Since then, the TNCMPFL has been marketing its products under the Aavin brand. While it started off with processed milk, today, the brand covers a range of milk products, many of which have been sold through small outlets across the city (and state). Aavin has been on a spree of modernisation over the past few months. Old parlours are being refurbished and jazzed up. Play-areas, air-conditioning and brightly lit parlours seem to be the new normal, as Aavin tries to catch up market share in categories like ice-cream, flavoured milk and sweets. In the process, it is also changing a few of the bunks which were the main points of sale for these products. Happened to catch one such bunk in transition - which, by the way, is the 'Theme of the Day' for the city photobloggers today*. No idea why this Aavin booth had to be moved from wherever it was, but looks like it just needs a few people to transfer it to wherever it has to go to!